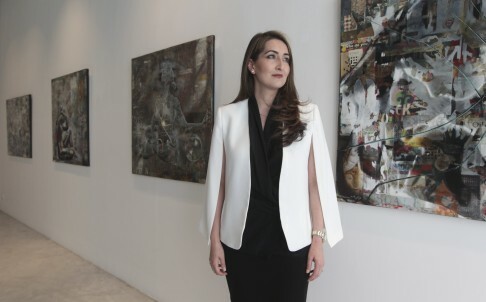 One of our new directors, Mrs. Yas Mostashari Chang, talks about her experience in realizing the first Iranian exhibition in Galerie Huit, and how her background has equipped her with the passion for and knowledge in the arts! Published in The Review, South China Morning Post. Yas Mostashari Chang was slightly taken aback to hear that this interview was going to lead to her being called a “tastemaker”. So let’s just say that Galerie Huit’s new exhibition, “A Postcard from Persia”, is an example of gallery cuisine: an appetite teaser. It was put together in six weeks, she says – “just as a taste”. Mostashari Chang, who was born in Tehran in 1973 and is one of Galerie Huit’s four directors, has a plan: to present a summertime hors-d’oeuvre to the city from five contemporary Iranian artists, assess the public’s appetite and then provide more substantial meals. It’s good timing. For the past few years, Iranian contemporary art has been moving to the forefront of buyers’ minds, not least in Iran itself; last month, an auction of modern and contemporary Iranian art in Tehran made almost twice what had been estimated, and a work by the late poet and artist Sohrab Sepehri became the most expensive painting ever sold in the country. It went for about HK$6.5 million. The title of the exhibition isn’t, strictly, accurate: only two of the five artists live in Iran, and Persia, of course, no longer exists. Yet the very word has connotations of a place, and a past, that may have disappeared but has left behind cultural ripples with an enduring relevance to the country’s diaspora. If anything, in some cases, the show is a postcard to Persia. Darvish Fakhr’s work, for instance, even to an untutored outsider, looks like nostalgia written on canvas. Power Lines Through Fasham shows a mountainous scene in Tehran province; what you feel is the hum of absent people. Fakhr, who was born in Canada and studied art in Boston in the US and London, now lives in Brighton, England, and his artistic sense has been moulded in the West. One of his works, a nine-panel portrait of dancer Akram Khan – himself a product of the Bangladeshi diaspora – is in the permanent collection of London’s National Portrait Gallery; and it was a BP travel award in 2004 that enabled him to explore Iran (which is strangely apt as BP started commercial life in 1908 as The Anglo-Persian Oil Company). Is Hong Kong an ideal market for such work? “Hong Kong is gaining momentum in the contemporary art world, so it’s natural to bring this link,” she says. She’s not sure what size the Iranian community is here (“very small, the smallest community I’ve known”) so she can’t necessarily rely on any exiled longings for art. But perhaps a transient background, the nebulous notion of home and the search for identity will strike a particular chord with residents and visitors here.